Future Proof Docs - Live Free MD — Future Proof M.D. Live Free MD is a sports medicine physician, big mountain enthusiast, cyclocross racer, and blogger. He is passionate about financial freedom, nutrition, functional strength training, and curing the obesity epidemic. If you’re not sure what cyclocross is, shame on you. Educate yourself here. As an athlete, I have always been interested in health and sports performance. After my undergraduate degree in Bioengineering, I took a break from all the computer programming and complex mathematics to work as a personal trainer for a weight management program at the Pro Sports Club in Bellevue, WA called 20/20 Lifestyles. While working as a personal trainer, I decided that the best way to promote exercise and improve the health of society was to become a physician. Sports Medicine was a clear choice based upon my interests and background. There are several routes towards sports medicine, including orthopedic surgery, family medicine, and Physical Medicine and Rehabilitation (PM&R). I chose the route through PM&R. PM&R is a lesser-known specialty that focuses on non-surgical management of orthopedic issues. Since the vast majority of sports injuries and musculoskeletal problems are non-surgical, this seemed to be a reasonable choice to serve the greatest number of people. I currently practice up in Alaska with an orthopedic group, where I treat sports injuries and work injuries to keep my patients active. I perform fluoroscopically-guided spine injections, ultrasound guided peripheral joint/tendon/nerve injections, EMGs/Nerve Conduction Studies, and impairment evaluations for the Worker’s Compensation system. At the end of residency, I found myself over $400,000 in debt. Being in a financial crisis wears on your soul and limits your options in life. After refinancing my loans and paying them off about a year ago, my outlook on life and work has improved significantly. 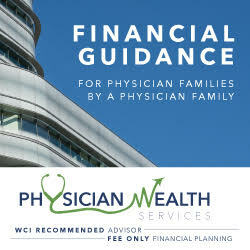 It is clear that financial health can be just as important as physical health. I started my blog in December of 2016 to help others improve their financial situation so that they can pursue their passions and contribute to society without financial stress. I’m in this for the long haul, so I don’t feel a need to rush my content. At this point, my goal is to produce one post per week, which is certainly manageable even though I am working 50 hours per week on clinical activities. I spend a considerable amount of time, perhaps 10-15 hours per week, reading financial books and other blogs but I have no problem fitting this in at the end of the workday or weekends. Reading, commenting on posts, and engaging on social media is actually a nice break from the intense and harried pace of clinic. This is purely an enjoyable and educational pursuit at this point. I have no intention of monetizing the site in the near future, so I have no conflicts of interest to report! Figure out what you are passionate about and then go do it. If you haven’t found your passion, keep searching. If you know what you are passionate about but it doesn’t make any money, then gun for financial independence as soon as possible and THEN pursue what you are passionate about. Keep yourself healthy by exercising daily and being disciplined with your nutrition. Financial freedom will mean nothing if you aren’t healthy enough to enjoy it. Find a way to contribute to society. Many professions, such as physicians and teachers, already contribute in meaningful ways. However, there may be things that feel more meaningful to you than a full time job. For me, this might be teaching a financial education class to high schoolers, writing a book, starting a business, or lecturing on the importance of preventive medicine. How I paid off $400,000 of debt. Don’t despair if you are buried in debt. You can annihilate your debt and get your life back on track. You need to learn how to suffer. Discipline, attitude, and behavior are more important than knowledge when it comes to financial and physical health. How to Earn your Freedom. This is what it’s all about. The freedom to fully pursue your dreams and passions without the restrictions of a full time job. Want to train for an ironman triathlon, volunteer overseas, learn to kitesurf, or start a business? Everything is possible when you’re free.